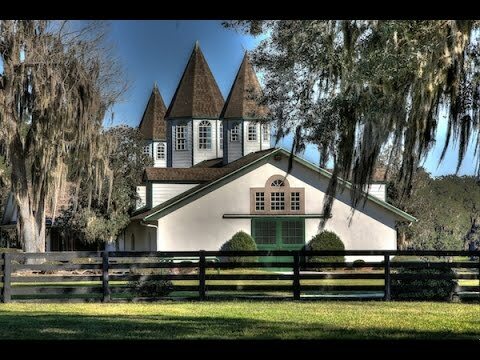 As one approaches this prized Equestrian Farm, known as Padua Stables, you are greeted by meticulously kept grounds. Padua is known its rolling, gracious countryside it covers as well as for being rich in sunlight, spring-fed lakes and ponds, granddaddy oaks and limestone. The 8,000 square foot main residence is designed for entertaining. Consequently the pool and lanai area overlooks the largest lake of the property. Exceptionally nice private housing for guests, managers and staff. There are a total of 13 residences on the grounds plus a 7000 square foot dormitory with 22 rooms to accommodate a large-scale operation. Training complex consists of 116 stalls, 3/4 mile dirt track, 1 Mile turf track, 4 covered hot walkers, round pens, and lush paddocks. Facilities are in place for a stallion-breeding center or sporting/eventing center plus broodmare/foaling complex. Corporate executive office has a conference room, commercial kitchen, perfect for entertaining your clients. Additionally there are three green houses for growing all your own vegetables or annuals. Underground utilities, plus extensive site improvements. cushion and superior drainage system.